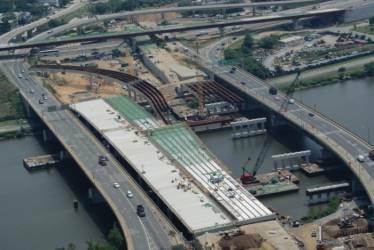 This major design/build project will provide three new bridge spans over the Anacostia River in Washington DC, separating freeway traffic from the local traffic. In order to meet the general contractor’s aggressive schedule, the initial phase of the project included galvanized 1-1/2” diameter F1554 grade 105 thread each end rods, 2” diameter F1554 grade 105 galvanized thread each end rods, and 3 diameters of F1554 grade 105 all thread rod which we shipped in one week. Portland Bolt shipped all of these items on time thanks to our domestic steel inventory, fast track manufacturing, and in-house hot-dip galvanizing. For phase 2 of the project we manufactured 9,000 pounds of galvanized F1554 grade 105 overhead contact system (OCS) foundation anchor bolts for the new streetcar line. Portland Bolt supplies anchor bolts and construction fasteners for highway projects in all 50 states. We specialize in fast track, 100% domestic product and supply full and complete certification with all of our orders. Portland Bolt works to your schedule.